Bert Lahr was neurotic about other comedians stealing his material. 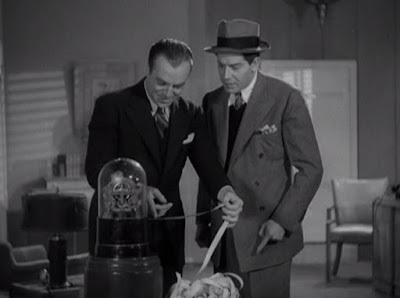 I wrote in a previous article about Lahr threatening to sue Warner Brothers because he believed that Joe E. Brown copied his style of mannerisms in Hold Everything (1930). A tenacious lawsuit, a threat of a lawsuit and just plain harassment arose in later situations in which Lahr perceived that his material had been stolen. 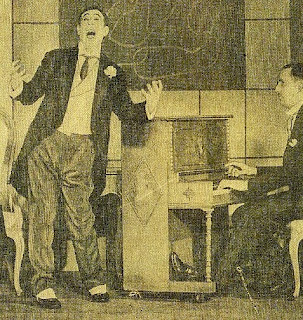 In 1934, Lahr starred in a popular musical revue called "Life Begins at 8:40." The comedian received raves for his performance. 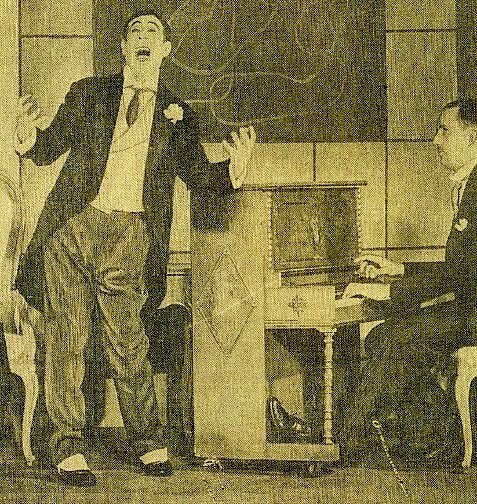 Critics singled out Lahr's work in the musical number "Things" and a sketch called "A Day at the Brokers." Lahr always contributed a good deal to the material that he was given. Writers admired the comedian for using his many unique talents, including his line deliveries, gestures and facial expressions, to elevate their dialogue and situations. The music for "Things" was written by Harold Arlen and the lyrics were written by E. Y. Harburg and Ira Gershwin. Arlen said, "[Lahr] fussed and fumed and was frustrated, and extemporized to get gimmicks into 'Things'—for instance, his toupee falling a certain way. It was an endless game for him, until he finally got as many laughs as possible out of it." Lahr's son John agreed that his father's special touches were evident throughout the act. He indicated that he made the toupee an important element of his performance. He wrote, "Lahr came on stage in a tuxedo and sporting a brown hairpiece that brought his hairline, like a dorsal fin, to an abrupt point on his forehead. A piano player sat beside him, elegantly poised for the recital." The inelegance of the toupee comically contrasted the elegant aspects that otherwise defined the recital. Bert Lahr sings "Things" in "Life Begins at 8:40." Here is Brad Oscar singing "Things." Milton Berle was booked to replace Lahr in a road tour of "Life Begins at 8:40." Berle's success in the play was a great boost to his career. Critics made a point to praise Berle for his work in "A Day at the Brokers." Lahr resented this. The broker sketch was his sketch. It was he, with his various gimmicks, who had spun comic gold out of the sketch. Berle, he believed, did nothing more than copy his gimmicks. One wonders if he made use of Lahr's dorsal fin toupee. Lahr reportedly sent Berle a telegram that read, "Thanks for doing me." [This] marked the beginning of a longstanding feud between the famed "Cowardly Lion" and the brash young comic, occasioned for the most part by Lahr's jealousies and insecurities. It was simply fate that, as far as versatility was concerned, both comedians had much in common, and a lot of material Lahr performed was tailored for Berle's talents as well. Lahr took it personally and never forgave his replacement in "Life Begins at 8:40." But it got worse. Berle was in consideration to play the lead role in RKO's New Faces of 1937. When he was asked to make a screen test, he decided to perform the broker scene. "The test was good," he said. It was good enough for the producers to put Berle in the film and also buy the rights to fit the broker scene into the story. The scene became a highlight of the film and lead to Berle being considered by RKO for other films. For a time, he was in consideration to star opposite The Marx Brothers in Room Service (1938). As it turned out, RKO cast Berle and Jack Oakie to star in Radio City Revels (1938). Margarita Landazuri, a contributor to the TCM website, wrote, "[New Faces of 1937] features a classic Berle vaudeville skit, a hilarious stockbroker routine that's full of the shtick that would become his trademark as a television performer." So, the broker sketch, which Lahr saw as his sketch, established Berle as a nationally recognized star. [Berle] was ticklish about the issue as late as 1975, when his memoir was published. Remarking on a Bert Lahr sketch that he reprised in the RKO musical New Faces of 1937, Berle stressed that the producer had bought rights to the routine from its author. "I said words that Bert Lahr had first said on a stage," Berle wrote, "but they were David Freedman's words, and their use had been paid for. Yet I heard grumblings and lousy remarks that Bert Lahr was making about me for stealing the sketch from him." Berle did not hold a grudge against Lahr. When he was contracted to star in Always Leave Them Laughing (1949), he got the producers to hire Lahr for a key supporting role. The film involved a comedian who achieves success by stealing an older comedian's act. Lahr was to play the older comedian. Did Berle recognize the irony? Presumably, Berle arranged Lahr's casting as a peace offering, but it was obvious throughout the film's production that no peace was to be found. In the end, the film only increased the tensions between the two comedians. Lahr signed a contract to work five weeks but he found on his arrival in Hollywood that he had been almost written out of the picture. He said, "When I got there, there was hardly a thing for me to do. I made one appearance as the cop in my old cop act, and that was only included as a plot point, to show audiences how I worked so that Berle could copy me." 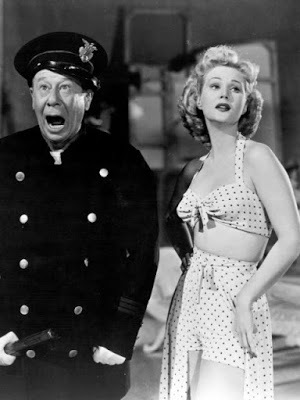 Bert Lahr and Virginia Mayo perform the "cop act" in Always Leave Them Laughing (1949). The script was rewritten to give Lahr a song and a sentimental scene where the old comic shows the young one how to be professional. Off camera, the same struggle was taking place. [Lahr said,] "Berle was watching the picture very carefully - it was his picture." This attitude led to conflicts. The first was the day in which Lahr's "sentimental scene" in the hospital took place. "We shot all morning. I came in early to see what I was going to do. I look out by the camera, and there is Berle. He stayed there all morning watching my scene. I was so upset I blew my lines. The only way that it got into the picture was that I convinced him there were no laughs in the scene. I don't think he knew the difference at the time. It's just as much value getting interest and sympathy as it is to get laughs." In another scene, where Lahr and Berle did a song and dance routine together. Berle protested and almost brought the two performers to blows. "When we were doing this song and dance together, I had on a Sulka tie with a little design in it. Berle objected to the tie because he said I was trying to take attention away from him." Lahr capitulated, but the experience remained "one of the most unpleasant situations I've ever had in pictures." Lahr was angrier than ever. [I]t was my idea to cast Lahr as the older comic. I thought he'd be great in the part and he was. He was a terrific comedian and actor. However, after the film came out, Lahr was suddenly telling everyone that I tried to cut him out of the picture, that I ruined his best scenes. Bert's son wrote a book about him [Notes on a Cowardly Lion] in which he repeated these charges. They're bull but don't take my word for it. Read the book. See what Lahr said about the movie and what he says I did. Then watch the movie. It's on The Late, Late Show every ten minutes. You'll see that Lahr is terrific in that movie. Yeah, one or two of his scenes hit the cutting room floor. Ten or fifteen of mine got cut. Scenes get cut out of every movie. But you watch the movie and see if Lahr isn't great and if I'm not supporting him in every scene we have together, letting him be great. He's got this great dying scene and I could have horned in on it, had them cut away to my reactions more and stuck in a lot of dialogue for my character but I didn't. Because it was Bert's scene and it worked best to let it be his scene. But like I said, don't take my word for it. Read the book, watch the movie and if you believe I tried to hurt his performance, then all the things they say about me must be true. I will stake my reputation on that. 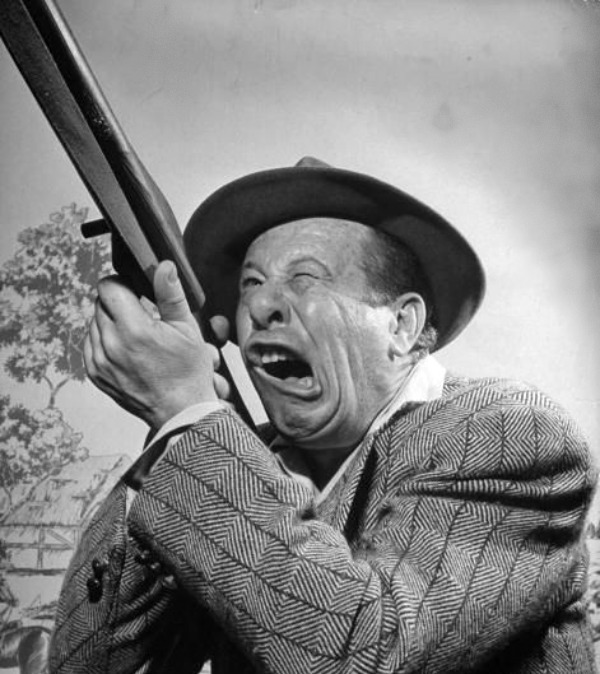 The great comedian Bert Lahr loathed the great comedian Milton Berle. . . [Lahr] repeatedly blackballed Berle for membership [in The Lamb's Theatre Club]. During one of Lahr's absences in 1954, Berle was finally admitted. This enraged the Cowardly Lion, who quit the club. (As savvy Mike Mearian said, "He was resigning all the time."). Tom Dillon (later shepherd) understood how much Lahr loved the Lambs, gathered a delegation, headed to Sardi's where Lahr was hanging out, and coaxed him back into the fold. Let us take a look at a television commercial from 1958. The commercial was broadcast nationwide for a cleaning product called Lestoil. As you might have noticed, the cartoon duck speaks an awful lot like Lahr. The voice was provided by comedian Sid Raymond. It is unknown how long this commercial aired or at one point Lahr saw it, but the comedian did finally get around to filing a lawsuit against the product manufacturer, Adell Chemical Company, and the commercial producer, Robert Lawrence Productions, in 1961. He demanded $500,000 from the defendants for their "misappropriation" of his "creative talent" and "trading upon his fame and renown." The defendants argued that Lahr had waited too long to sue them. This argument prevailed in the lower court, but the argument was not sufficient to deny Lahr the right of appeal. The suit was ultimately settled out of court. In 1962, Lahr threatened to file a similar lawsuit in regards to yet another cartoon character that mimicked his vocal delivery to hawk products on television. The character, voiced by Daws Butler, was Snagglepuss, who was introduced in 1959 on Hanna-Barbera's The Quick Draw McGraw Show. Lahr threatened to sue Kellogg's, Hanna-Barbera and Screen Gems (the distributor of Hanna-Barbera's cartoons). Martin, a commenter on the Cartoon Research blog, explained the outcome of the situation ideally, "Lahr did some saber-rattling. . . Given the circumstances, Kellogg's and company were, for obvious reasons, inclined to come to terms with him, too." This is the reason that the Cocoa Krispies commercials featured the printed line: "Snagglepuss voice by Daws Butler." I just saw Some Like it Hot for first time and thought Joe E. Brown was Bert Lahr. I had surgery yesterday but the facial expressions and mannerisms still provoked me to search. Loved Bert! I recognize similarities between Brown and Lahr. Lahr was not entirely wrong. Joe E. Brown came long before Lahr!